As you make your way down into the campsite, you’ll find The Hub just before the entrance to the Festival Village on the right-hand side. The Hub is home for all your campsite needs. Whether it’s tea and company at 3am or a place to bathe your baby at 6am or a loaf of bread or someone to fix your tent – you will find it all here. Mobility Hire is now up at Festival Reception, making it easier for those needing assistance to get onto site. 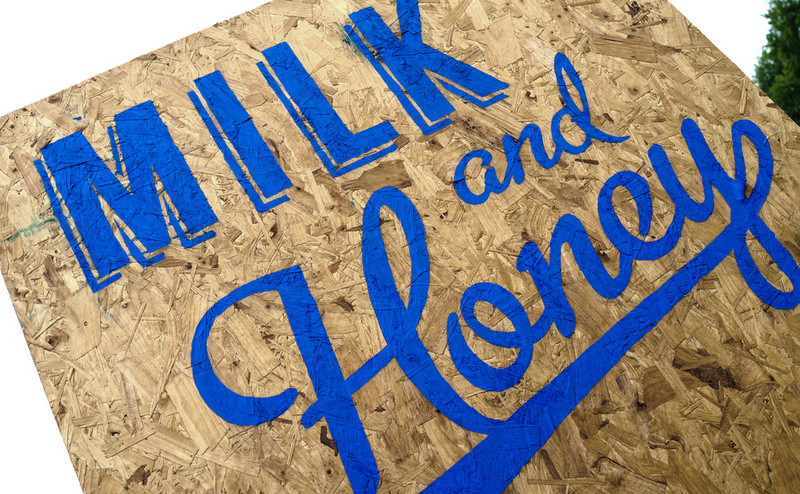 Our on-site store Milk & Honey is run BY Greenbelters FOR Greenbelters. Established when we moved to Boughton in 2014, it’s now a mainstay. You can find camp cooking essentials such as bread, bacon, biscuits and beans. (Food beginning with other letters will be available – Milk and Honey, for example). The volunteers greet you with a cheery smile and beautiful aprons so be sure to pop in or find them on twitter @gb_milkandhoney if you’ve any questions. The Parents’ Support Venue (PSV) is our dedicated space for those with really young children across the weekend – where you can feed, bathe and change babies and young children, or just chill out! The 24-hour Kindred Cafe is exactly what it says it is! Pop in at any time for something to eat, some company. Or, for a small fee, they’ll also fill up your hot water bottle if the nights get chilly, so make sure you pack one! The menu here is especially geared for families, with fish finger sandwiches a particular favourite! Ibex Camping sell lots of really useful things like tent pegs, waterproofing spray, sleeping bags, torches and other camping essentials you might have forgotten or broken. However, if you think your tent is beyond a few extra tent pegs, visit the CampLight Area (towards the showers and Glamping area) and they will try to help fix your tent for a small fee. Showers can be found further down the fields towards the Glamping area. And inside the Festival Village itself you’ll find food and drink to please almost every taste we hope. (And yes, we will be blogging about food vendors next week).